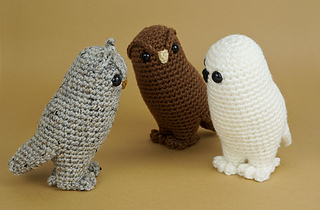 This pattern is available from planetjune.com for $8.00. 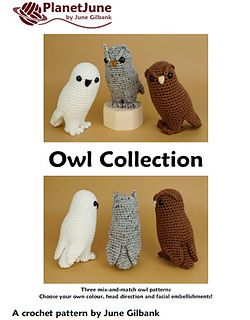 Owl Collection is an original crochet pattern by June Gilbank. 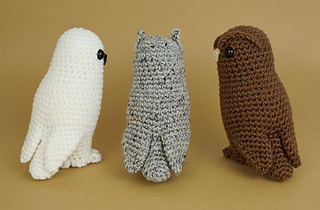 Owl Collection is a clever low-sew design: the head, body, legs and wings are all crocheted as one piece, giving you an elegant bird silhouette with the perfect owl posture and an effortlessly smooth result! 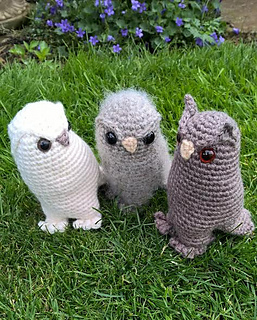 This pattern includes endless options: by varying the colours, the direction the head is looking, and the facial embellishments, you can make your own customised owls. 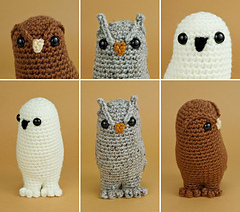 This is a detailed 11-page pattern. 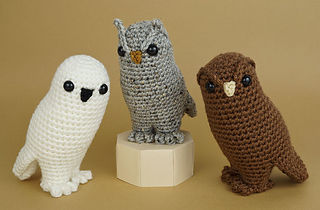 In addition to the written crochet pattern instructions, it includes 45 step-by-step photos for the special crochet and construction methods. Size: approx 6” (15cm) tall when worked in worsted weight yarn.